After visits to Deschutes, Bailey’s, Pine State Biscuits, Coalition Brewing, and Migration Brewing (read all about it in Part 1), Jeanne and I were off to a great start in what ended up being another impressive Portland exploration trip a couple of weekends ago. East Burn. Click to see the rest of the photo set. We were enjoying the sun and beers so much at Migration that it was tough to tear ourselves away from the picnic table, but we finally managed to get on our way. We headed back down to Burnside, and then started off west towards the city center and towards our intended next destination, Burnside Brewing. But, we walked right past a bar called East Burn that a bartender was just talking to us about. Seemed like an awful shame to pass up the open sidewalk table sitting in the sun. So, in we went and grabbed pints of Hub IPA and a pale ale from Lucky Lab on nitro. The bar itself seemed like a nice enough spot with a solid beer selection. One of the appeals of East Burn is a “winterized” back patio welcoming to customer year-round. We enjoyed our pints back out in the sun and were then back on our way to our next destination. favorite of the bunch, and of the entire day, was their Sweet Heat. This wheat beer perfectly balanced apricot along with just enough spice from scotch bonnet peppers to create a 4.9% sessionable brew. I remember a beer called Calypso from Roots that I sampled at the Oregon Brewers Festival a couple of years ago that was very similar, and I’m guessing that was the starting inspiration here. To some, this beer may sound like a gimmick. Let me assure you that it is not. I sincerely hope this will be part of their year-round lineup or at least throughout the summer. We read a recent review of Burnside in the Portland Mercury, and it mentioned how impressed they were with the food. We partook in their rotating house-made sausage plate, which on this visit included three sausages: boar, lamb, and elk. I thought they were amazing, and I was tempted to just eat dinner here. But, we still had one more stop to make before we wanted to take a quick break and then head out to dinner. Our final beer-focused stop of the day was at the shrine to sour beer known as the Cascade Barrel House. I’d visited just once previously not long after they had opened last year, and I was looking forward to another pilgrimage to the source of great sour beers in the northwest. 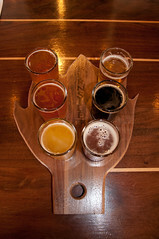 Cascade Brewing has their main home at the Raccoon Lodge in Southwest Portland a bit outside of the downtown area. But, owner Art Larrance and Head Brewer Ron Gansberg wanted a place in the heart of Portland where they could feature their unique sour beers. On this trip, I was treated to a glass of their Straight Double Red, poured directly from the wooden barrel. We also enjoyed glasses of the Sang Royal, Sang Noir, and tasted samples of the IPAnox, Karma Citra IPA, and Saison Fume; all pretty outstanding. The place itself has a good amount of outdoor seating that was filled up on this sunny day, and there are also plenty of tables and bar space inside. I love sour beer, and I love Cascade. I’m pretty sure no future trip to Portland will be complete without a trip to the Barrel House for me. On a bartender’s recommendation we ended up at Laurelhurst Market for dinner, which is part steakhouse and part butcher shop. It turned out to be a laid-back spot, with good cuts, interesting preparations, and reasonable prices. They don’t take reservations for parties of less than six, but I’d highly suggest that you call ahead. My super smart wife had that idea, and they do allow you to put your name on the list over the phone. It was a good thing we did, because the wait approached two hours total. We showed up a bit early still, and by the time we were halfway through our first drinks at the bar (something from Fort George Brewery) they were ready to seat us. In addition to the steak, the house-made mozzarella appetizer was out of this world. After a well-earned good night’s sleep, we enjoyed a relaxed day starting with brunch at Mother’s, which was very good and worth the wait. From there it was off to explore the Saturday Market a bit, and then we spent an hour drooling over the stacks of books at Powell’s. 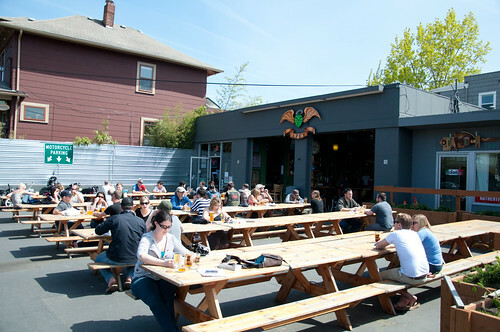 By mid-afternoon, the sun was fully shining and we were ready to soak some of it in while sipping on beers at one of Portland’s finest outdoor drinking spots, Apex. To my delight, one of the first things I spied on their impressive menu (displayed on a large screen television) was Russian River Blind Pig. This hoppy and sessionable IPA is my favorite beer from Russian River, but it is not distributed to the Washington market (you people and your damn love of Pliny ruin everything). I had a couple pints of that and also enjoyed a beautiful Aktien Helles Lager from Germany that was very fitting for the warm and sunny weather. Before long, it was sadly time to head towards the train station and back home. This trip to Portland was just another reminder of how much great beer and food there is to explore. It’s easy to get around, and the neighborhoods are set up perfectly for maneuvering without a car. In the area of town where we spent most of our time on Saturday, you could have easily made visits to 10 other worthy beer spots, including Hair of the Dog, Upright, Lucky Lab, and the Green Dragon. You may not have time to hit everything you would like to, but you can always try. Took a trip down to Portland yesterday and had a great time. First stop was at the Cascade Barrel House. I love the place and don’t think they make a bad beer. Plus, the cuban sandwich was awesome. Then stopped at Apex. First time being there and it didn’t take long to become one of my favorites in Portland. So many great beers to choose from but had to go with some Blind Pig. Then we went to our last stop at Belmont Station. Always have to stop there to get some Alesmith beers since they don’t distribute up here. Plus picked up the Cuir from The Bruery, can’t wait to try it. I always love going to Portland and can’t wait to go back.